Last week I spent a couple of days at home suffering from a horrific, child-induced cold. On the first day I had to take Boo to the doctor's office on the way to school, and by the time I'd dropped her off back at nursery, Stash had opened. Since I walked by on my way home and had some time to kill, I went in. I browsed about until the lovely proprietor asked me if I was looking for anything in particular. When I said "Something to make my cold feel better" she immediately said "Alpaca. 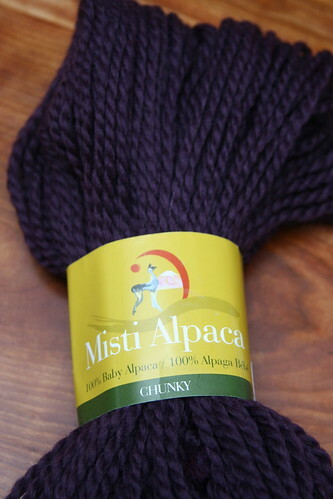 Bulky alpaca." And there I was, in front of a bunch of shelves of this. It's been a long time since I've knit which chunky yarn, and boy was I happy to find that, at the end of about three hours, I had a new scarf. 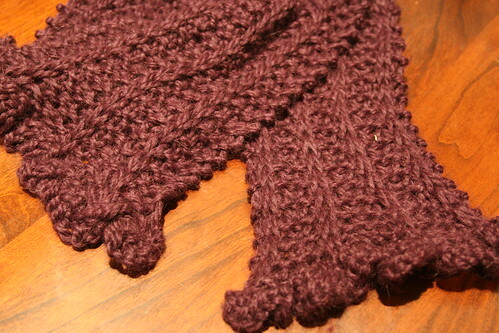 Pattern: Chunky ribs & ruffles scarf, by Nancy Kleiber, a free download on the Misti Alpaca website. Comments: This pattern was perfect mindless knitting for a head cold. 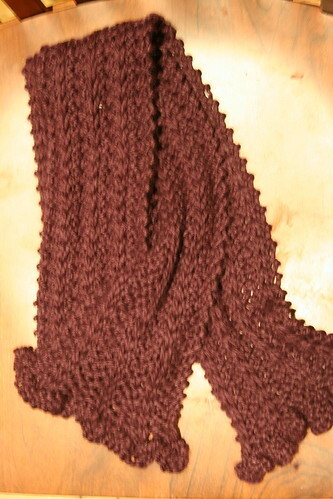 After blocking, it's about 60 inches long and 4 inches wide (+/- an inch or so at each end). Nice and cuddly, and long enough to wrap around my neck and tie in the front. It nicely fills in the bare space at my neck when I've got my coat on. Written by porpoise On November 17, 2009 In "FO", "scarves"